Zimbra’s extensibility opens up opportunities for the community to build enhancements to its core functionality and bring new, custom features to Zimbra users. One of our latest examples comes to us from ProcessMaker. Take a look at how it uses the Zimbra API to add enterprise workflow to Zimbra. ProcessMaker is a leading open source workflow and business process management software suite that allows users to design and automate form based approval driven business processes across the organization. The ProcessMaker Zimlet allows enterprises to solve their main communications needs in a single interface: email, calendaring, tasking, document manage and now…workflow. We’ve worked to make the ProcessMaker Zimlet simple to install and set up. Under the “Setup” tab, the user completes the one-time configuration of the Zimlet; during the first launch, users are prompted to configure their connection to their ProcessMaker Server, retaining their username, password, selected language and workspace. The Zimlet then uses this configuration to connect to their usual ProcessMaker session within the Zimbra interface, without ever being required to input a password again. The Zimlet is also available in several languages, including English, Spanish, French, Italian, and Chinese among others. The Zimlet provides embedded ProcessMaker functionality within Zimbra, allowing users to access the ProcessMaker Workflow Software through their Zimbra email interface. Enabling users to manage and run their business processes directly from their Zimbra inbox provides convenience, practicality, and above all, enhanced efficiency. 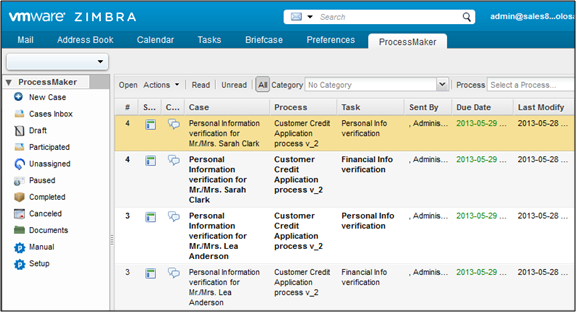 ProcessMaker also has web service connections to the Zimbra Calendar, tasks, and even briefcase to enable ProcessMaker workflows to interact with Zimbra through each of these services. So if your workflow needs to create an event or a task, or even upload a file, all of this can now interact directly with Zimbra. To illustrate the code that the Zimlet uses, we will review how the Zimlet consumes ProcessMaker Webservices. For more information on the methods included in our webservices, please refer to our ProcessMaker Wiki Guide. Large organizations (several hundred users upwards to thousands of users) have significant workflow needs. Organizations want to be sure that their key processes are being performed the same way every time in order to deliver consistent and measurable results. Is there a demo environment availeble where I can see the Procesmaker zimlet active? So it is only for large companies those have more then thousands users? Organizations want to be sure that their key processes are being performed the same way every time in order to deliver consistent and measurable results.